website or don't want to hire web designers - this Mobirise Bootstrap Builder is the right choice for you. As of today, Mobirise offers more than 30 design themes and templates. Each Mobilrise theme is one of the multipurpose and also has an unique design as well. Also, the parts of the websites are also interchangeable - which means using other parts of a template into another template. Download and install Mobirise: Mobirise is completely free to download and safe to use. You can download the software from the official website. The installation file is a ZIP file which needs to be unpacked before installing. Choose a free theme: After the initial sign-up, you’ll be greeted with the option to select your own theme. You can select some of the freely available themes like Mobirise AMP, Mobirise 3, Mobirise 4 or even Purity M.
Choosing a theme is easy as you have to just open the application, and then head over to the right dashboard, to the ‘Sites’ tab. After clicking on the ‘Sties’ tab, click on the ‘Create New Site’ tab where you can find all the themes that you can use. You will find more themes under the ‘Extensions’ section of the same dashboard. 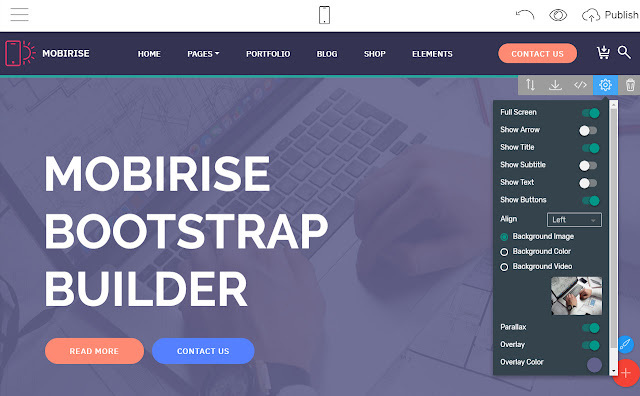 In case you don't want to use any of the free themes, you can just import any Bootstrap 4 template which is based on the Mobirise 4 template. Design templates: You can customize your project as you like, using footers, menus, headers, contact forms galleries, etcetera. You can use drag-drop feature and even edit texts. Placing a block on your page is just drag-drop too. Site styles panel can be found from the ‘Sites’ tab on the dashboard, under the ‘Blue Brush’ button. Manage pages: Mobirise allows you to add many pages and even recreate pages by cloning existing pages. Under the page settings, you can change the page description, title and even the URL. Even though Mobirise is free - the features offered are truly great and world-class. Building professional looking websites is not difficult using Mobirise. Overall, highly recommended.